Focus on building a business — not a team. A business is something you own — to achieve goals for your life. The goals are a mix of financial and personal lifestyle goals. Never forget that your goal is to create a business and achieve success in your business. If you do this, you are already mentally ahead of 99% of other real estate agents. To be a real estate agent, you need to run a business, manage yourself, do marketing, do sales, manage the finances and accounting, organize one or more physical office spaces, use technology, and a few other things. 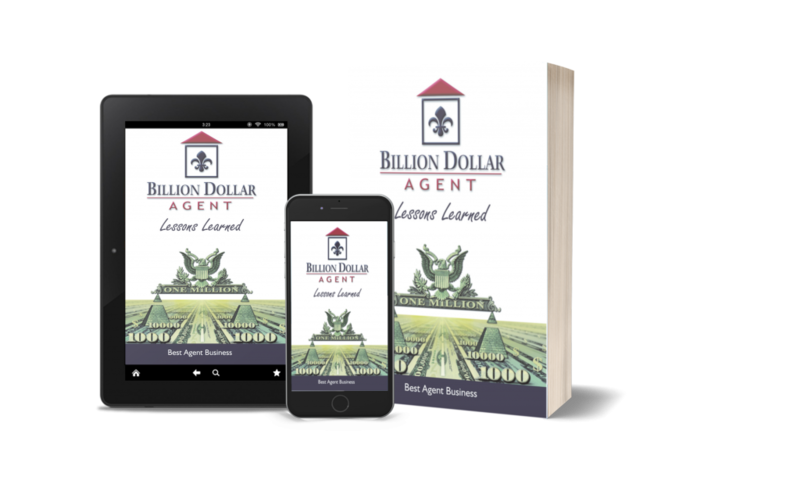 Do you think that a Billion Dollar Agent does all of that by himself or herself? Nope, they delegate. Imagine that you tried to do it all yourself and never worked more than 40 hours per week, like a normal job. Imagine that your average price of a home was $250,000, you averaged a solid 3% commission, and you had an 80/20 split with your broker. If you did 12 deals, or twice as many as the average agent, you would have $72,000 GCI and perhaps a net profit of $50,000 which is probably equivalent to a normal job of $40,000/year taking into account benefits such as vacation/holidays/health insurance. Currently, the real estate industry focuses on ‘teams’. We believe that teams will grow even faster and gain an increasing market share of all real estate transactions. Most importantly, businesses, such as those profiled in this book, will grow the fastest of all. A team tends to imply people, who may be assistants on salary or sales agents on commission. The bigger the team is not always the better business. People cost money and if your mental focus is on building a team, then you may end up overstaffing and wasting money. Your mental focus should be achieving your goals through your business. If one of those goals is growing your business, you need to be specific about whether your goal is a net profit dollar amount or percentage, or simply a revenue figure attached to a number of transactions, or GCI, or dollar volume sold. We suggest that net profit should be the key focus, connected to personal lifestyle goals including hours worked. You want to build a team which is a mix of vendors and part-time assistants and part-time agents to leverage your time and focus on your unique talents. Too many agents who start to get busy think that they should go hire a buyers agent. Based on the experience of a few agents in this book who had three or four full-time assistants, before ever having a buyers agent, we suggest you consider a very different staffing model than most people talk about in the industry. We propose levels of staffing that are typical in the progress of top agents. Part-time agent: You are working part-time in real estate. Full-time agent: You are working full-time in real estate. Vendor Outsource: You delegate and outsource to vendors as much as possible. Part-time assistant: You have a part-time assistant for 5-15 hours per week. Full-time assistant: You have a full-time assistant. Multiple assistants You have multiple part-time,or full-time assistants, so you can fully leverage your time for your unique talents. Part-time agents: You use part-time agents for open houses and showings. You pay these people hourly, not a commission split. The assistants handle a mix of marketing, listing, and transaction coordination. The more specialized, the more profitable. At this point, you may be doing 50-100 homes a year and be spending 5- 10% of GCI on outside vendors and another 10-15% of GCI on assistants and part-time agents. Showing agent: A showing agent is paid less than a buyers agent. Buyers agent: A full-time agent who takes a highly qualified buyer lead and works with them to buy the house until contract is signed. Most of the rest of the work is handled by transaction coordinator. Listing agent: Often, the agents in this book hold on to the listing side of the business for the longest. About 10- 20% of agents in the book have started to delegate some or all of the listing side of the business. Management: During the process of having multiple assistants and getting your first buyers agents, someone needs to manage different aspects of the business. Some of them may be managed by you if they fit your unique talent. Some should be managed by other people. This includes the management of marketing, sales, people, operations/systems, and accounting. You are now running a multi-million dollar business with 10- 50 staff and you need 2-3 people on your management team.